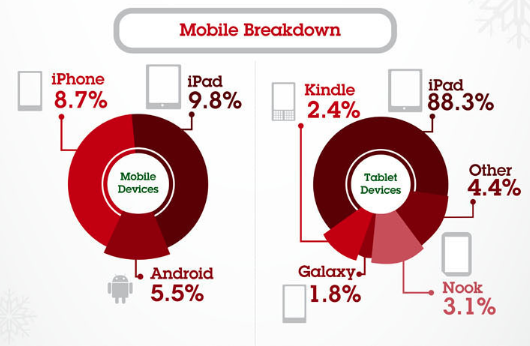 IBM has just released their report on Black Friday sales, which shows that iOS devices accounted for 18.5% of online transactions compared to just 5.5% for Android. Unsurprisingly, this report caused quite a flutter in the tech community, with many calling this the Android "Engagement Paradox". Let's attempt to reconcile the differences between the conflicting research findings related to usage and install base. The data clearly shows that Android's usage share growth (at least until mid-2012) has been primarily driven by Android 2.3 Gingerbread, which is consistent with the version distribution published by Google. 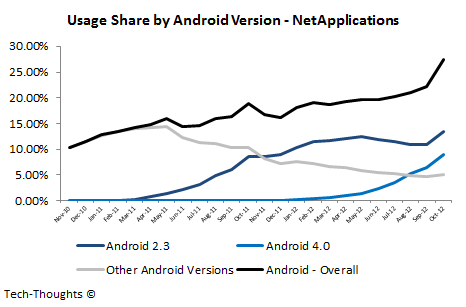 Since smartphones comprise the vast majority of Android 2.3's install base, Android's usage share is mostly driven by smartphones. Android 4.0, in the chart above, includes both smartphones and tablets (but the Kindle Fire HD was the only significant launch on Android 4.0, in September 2012). The declining usage share of "Other Android Versions" suggests that the vast majority of this is driven by older Android versions on smartphones as opposed to tablets. 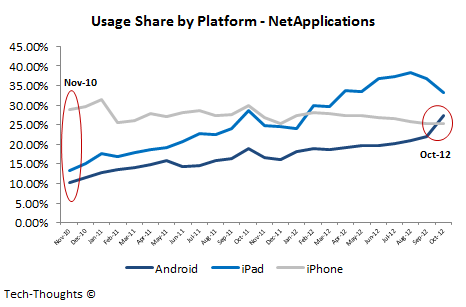 Now that we've understood the pace of usage share growth, we can attempt to analyze the reasons for the disparity between the usage shares of both platforms. The first and most oft quoted reason for this disparity is that the average iOS user tends to be more "sophisticated" and have higher income, as compared the average Android user (driven by Apple's premium positioning and Android's mass appeal). A second, slightly related, but lesser known factor is the access & availability of WiFi. 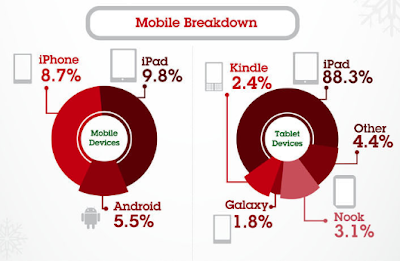 Android seems to be leading all iOS devices (both the iPhone and iPad) in browsing over cellular networks. This means that Android users either have no WiFi access (understandable for lower income users) or prefer to use other devices for browsing when they do. This suggests that this is a "browser engagement" issue and not necessarily a "user engagement issue". Let's attempt to understand the reason for this. Curiously, the chart shows that per-device browser engagement on Android 4.0 has increased in line with the install base (the data for the first few months of a new Android version may be distorted by a small sample size for usage share). This means that per device browser sessions have increased over time. The most likely reasons for this pattern are the browser improvements introduced in Android 4.0, along with the introduction of the Chrome browser (which became the default browser in Android 4.1). The stock Android browser in previous versions reportedly had problems rendering non-mobile optimized web-pages, leading to lower usage. If a user realized that certain webpages were improperly rendered on a mobile device, it would obviously lead to a drop in future browsing sessions from that device. Meanwhile, on Android 4.0, as consumers have realized that the browsing experience is more "desktop-like", it has led to an increase in browser usage. This suggests that as the penetration of Android 4.0+ tablets & smartphones increases, the Android platform should see a sharp rise in browser usage. It's definitely a possibility, but I'm afraid I don't have any more information about that than you do. If true, that would basically render all browser usage data irrelevant. I think the core issue is still using browser usage data as a proxy for engagement. I don't believe the stock browser allows you to be categorized as iOS, but it does allow you to change your user agent to "desktop". I can use that stock feature to bypass many mobile-restricted sites, and I know many people who only view webpages in "desktop" mode on their android devices. On my android tablet however I use Dolphin Browser, which is set to have websites believe I am on an iPad. Interesting. I think the "desktop" option is only available from Android 4.0 onwards. This means it's very likely that the usage share and hence, per device utilization of Android 4.0 devices is lower than it actually is. So many things wrong with this comment. Let me leave it at that. I guess u cant accept the truth. Apple, just like rim are hardware makers. Their os are exclusive, their hardware are premium. Thus their customers are different. Android and windows phone 8 are similiar in customers and makes. Comparing ios with android is like comparing the shopping habits of the american and chinese. Care to quantify any of your claims? The same paradox was noted in BI Intelligences' The Future of Digital presentation: "Do Android Users Actually Use Their Devices?" - http://www.businessinsider.com/future-of-digital-slides-2012-11#-121. Back to the current article - a good read, but I'm not convinced about the conclusion -- that demographic differences aren't an explanation; to the contrary, precisely because the Android device population is so fragmented, it would likely consist of segments that closely resemble iPhone users and those that don't at all (e.g. kids owning a cheap Galaxy device). It would be interesting to compare users based on demographic traits rather than chosen device (not that these are entirely independent). I'm not saying demographics aren't an explanation. What this post highlights is that there is a major difference between usage patterns before Android 4.0. The scale of that difference leads me to believe that the browser itself was one of the major causes. In the early stages of OS diffusion, there probably is a large variation in demographics, but as diffusion rises, those differences (within the android ecosystem) should reduce. But looking at this data today, that doesn't seem to be happening. 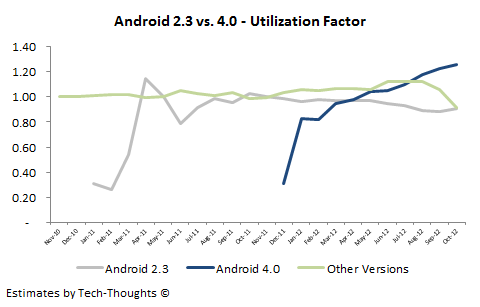 Even with higher penetration, the usage of Android 4.0+ versions seems to be rising.